This photograph taken around 1900 by R J Welch reveals the traditional fishing paraphernelia used by the fishermen of Port Moon. The boats in the photograph are double ended clinker built yawls, known locally as Drontheims, built to handle the heavy seas of the Atlantic. 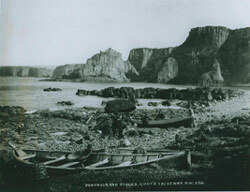 The rounded wicker pots, known as 'Buckie Pots', scattered around the boats in this picture were used to catch bait for use on the long lines. The circular wicker basket seen in the boat in the foreground held the baited long lines used for deep sea fishing. This map from around 1860 indicates the fastening points and dimensions of the 'Bag Nets' used to catch Salmon at Port Moon. The ingenious system of Bag Nets were introduced by a Scotsman called James Hector in the 1830s and caused Salmon to be guided in to a Bag by a 'lead net' that was fixed to rocks on the shore. This resulted in Salmon being trapped in the 'Bag' without suffering any damage that would be caused by being caught in the mesh of a net. 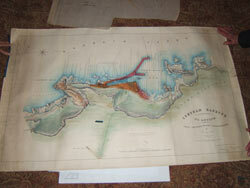 This map was a part of the license granted to catch Salmon at Port Moon from 1865 until 2002. 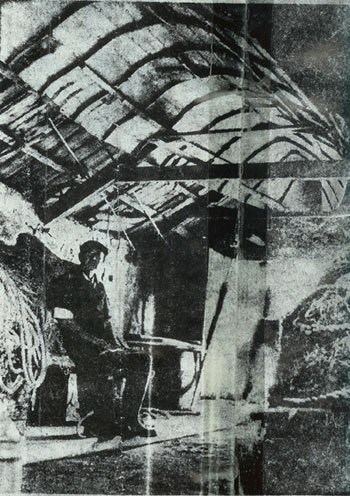 It indicates the position of the Fish House and uses the north west point of the building as a reference point to determine the legal dimensions involved in the fastenings and nets. 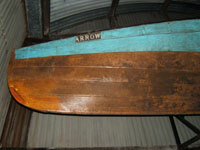 A local man penned the following poem as an homage to The Arrow and its crew from Port Moon. Her crew and her coxswain – five heroes of fame. In 1872 Sir John Coode, the leading harbour designer of the nineteenth century, drafted plans for a harbour to be built at Port Moon for Steamships to ship out Iron from a nearby mine. These elaborate plans proposed a rail link along a tunnel through the cliff to connect the mine in the adjacent Bay, Port Fad, to the proposed harbour. 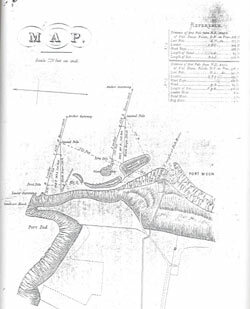 The plans indicate the presence of The Fish House (naming the structure as ' Boat House') and the now ruined Ice House in the bay as well as indicating an outline of the Bag nets attached to the rocks at Port Moon and Port Fad and a highly detailed depth survey of the bay. In the latter part of the nineteenth century The Arrow, a twenty five foot, four-oared rowing skiff was a great source of local pride. Port Moon Fishermen rowed The Arrow to victory in nearby regattas including the main event of the Portrush regatta that had a prize of £6, a princely sum well over a hundred years ago. Built over a hundred and fifty years ago, for nearly a century The Arrow remained unused in the rafters of the The Fish House. 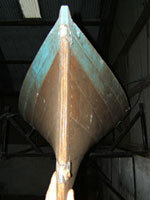 In around 1985 the boat was moved from Port Moon, restored and for a while exhibited in the Causeway Visitors Centre.